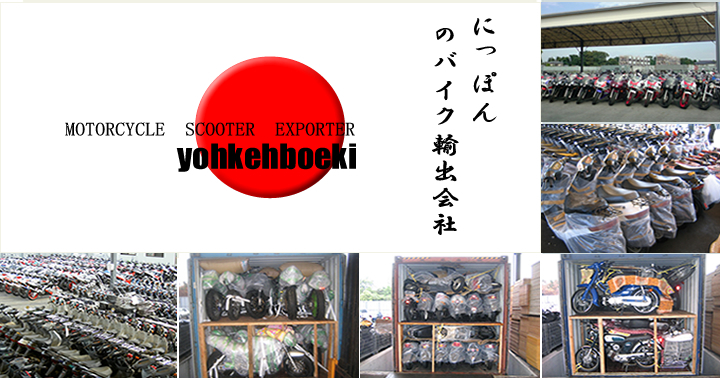 Yohkeh Boeki, a one of the biggest specialized Motorcycle and Scooter Trading company and Auction agent with our own storage yard and container pit. We were established in October 1979. More than 5,000units stock in our own strage yard. Member of big Japanese major Auctions. Professional advice on quality, prices and logistics. Reliable and fast packing and shipping from our own container packing pit. Well trained mechanics who are deeply informed about motorcycles and scooters. Staffs corresponding to some languages. Exporting used cars from Japan by Container and RoRo is also acceptable. and so on and load them safely into 20ft or 40ft container with long years expertise. Since we are working with our own storage yard and collection base and repair warehouse, We can supply our customer a good quality motorcycles and scooters which were passed our inspection procedures in a number of steps. Yohkeh Boeki, one of the thrived global company, deliver high quality products and adept service to your country. With our high quality stock, skilled staffs and global administration, we are going to expand the business scale to all over the world in the future. Our professional staffs who speak English, Chinese, Russian and Japanese assist you to import used motorcycles and scooters smoothly. We base our shipping on just FCL(Full of Container Load) shipping only. Please contact us about your interest, we will offer you the detail and best price.